Czech Republic auto major Skoda Auto has released a video of its full sized SUV Kodiaq in motion, though with heavy camouflage. 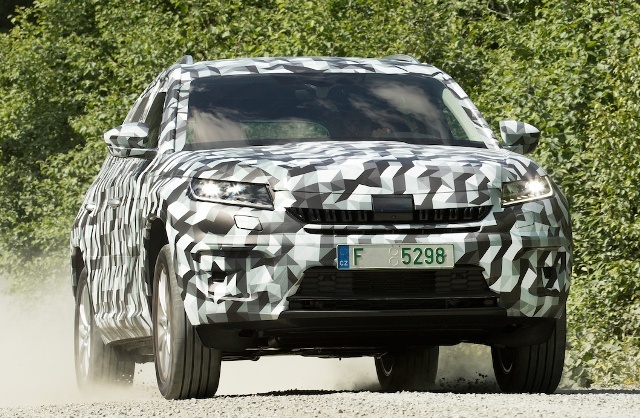 The Kodiaq SUV which is Skoda’s first ever full sized SUV will debut at 2016 Paris Motor Show. Built on VW MQB platform Kodiaq will share components with the new VW Tiguan. Skoda’s famous sedan Superb is also built on the same VW MQB platform. A 2.0 L TSI petrol and TDI diesel will power the Kodiaq and a plug-in hybrid version will also find its place sometime later. The Skoda Kodiaq concept was shown at Geneva Motor Show in March this year in the form of Skoda VisionS concept. The VisionS concept featured angular design styling heavily inspired by the Superb - especially the headlamps and taillights.